Discussion in 'General LFC Discussion' started by redabbey, Aug 7, 2015. Anybody else travelling to Antrim to this show? Just in the door, long journey to go to this great show but the effort was very worthwhile. All four ex-players are real gentlemen and great ambassadors for the club. Also the best value meet and greet ticket ever for ex-players, just £10 on top of the show ticket and that included a BBQ as well. Good to hear Lionel. When I saw Omniplex I had hoped it would be on in Dublin as well but not to be. Niall you would have really liked the show. John Keith would love to put on this show in Dublin, if a venue approached him. I spoke to Mr. Keith after the Newcastle game at the end of season 13/14, he was in the press box and I was in the paddock that day and I said to him that afternoon that I hoped he would bring his show to Dublin sometime. Met him again during the interval of his recent show in Antrim and he remembered our conversation and would still like to bring his show to Dublin at some stage if anybody knew of a suitable venue. He previously brought his 'Shankly' show to Cork. John, is the narrator of the show and it is different from show's where players are the focus, Bob Paisley is what the show is all about. 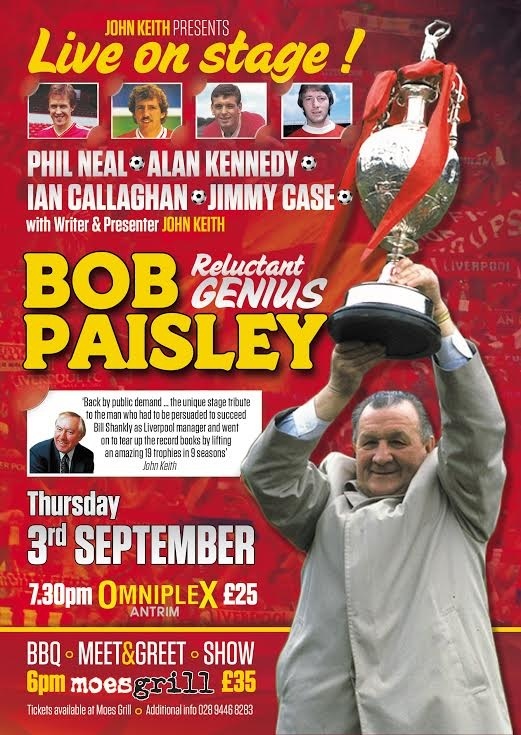 The four ex-players that he signed, Ian Callaghan, Phil Neal, Jimmy Case and Alan Kennedy are not involved at all in the show at the start as John Keith narrates the life of Bob from where he grew up to when he joined Liverpool. Archive sound interviews are used throughout. The four players mentioned only appear on stage when they became Liverpool players and were signed by 'Sir Bob', it is well into the second half of the show that Alan Kennedy joins the group on stage. The Liverpool player's tell many stories of there footballing careers as John feeds them questions throughout the show but at all times the main focus is not on them. Their contribution's, their insight and their respect for Bob are always interesting and informative. The show is sometimes a lecture, at other times hilarious with funny anecdotes about Bob but always insightful. Very evident from the audience was that there were often three generations of Liverpool supporters at the show. I am delighted to have a photograph with the four players from the show and this memento is something to treasure, it was a privelage to be photographed among such elite European Cup winning players. Niall, LKDAVE and STEVE1978 like this. 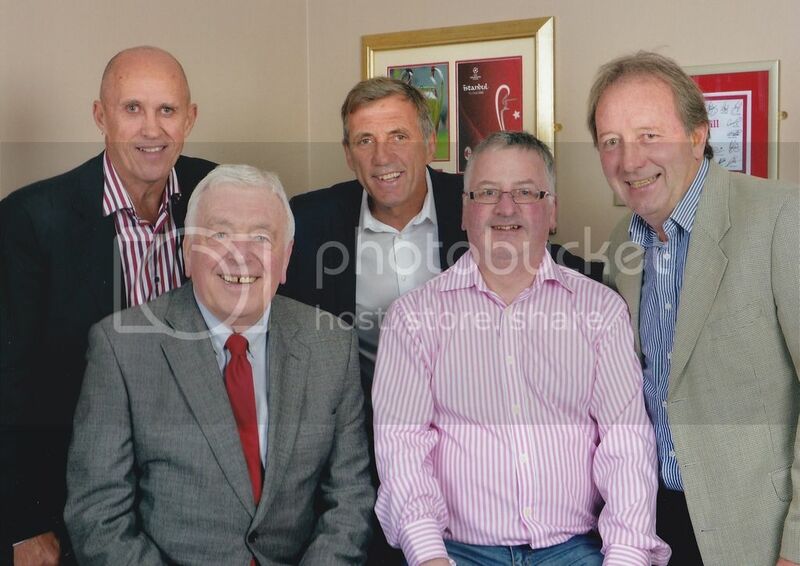 It was great to be photographed with true legends that have eleven European Cup winning medals between them. Picture was taken at Moe's bar and grill in Antrim. This pub/restaurant has it's own Liverpool clubhouse for fans /supporters to gather to watch matches. Rossie, Beanokelly, Gerry and 2 others like this. Just seeing that photo now Lionel, that's quality, 4 proper proper legends there. Never realised that Bob Paisley almost got the Ireland job the time Jack Charlton was chosen in the ballot. Football is a funny little thing. From what I remember bob was expected to get the vote for the job and big jack was the surprise announcement in the end. There was a good talk with John Giles on Newstalk last night about it all. Very interesting. Yeah that's where I got it from. Very interesting indeed. Listen in from 1 hour 36 mins into the show. Niall and STEVE1978 like this. LKDAVE, babbsnads and redabbey like this. Just seeing as their is huge interest in this newly found tape of the Bob Paisley appearance on 'This Is Your Life'. In the Shankly hotel in Liverpool, Bill's big red book is on display and here is the audio (only) of Bill Shankly on Eamonn Andrew's show. Always worth a trip into the hotel to see their memorabilia. Staying in it tomorrow night for the Shankly's Greatest XI dinner - it's a great spot for sure.